◕‿-Exactly the Coffee You Like.Adjust the grinders to the level of coarseness you prefer. ◕‿-Lifetime money back guarantee：We take all the risk out of your purchase by offering a bulletproof 100% money back lifetime guarantee. 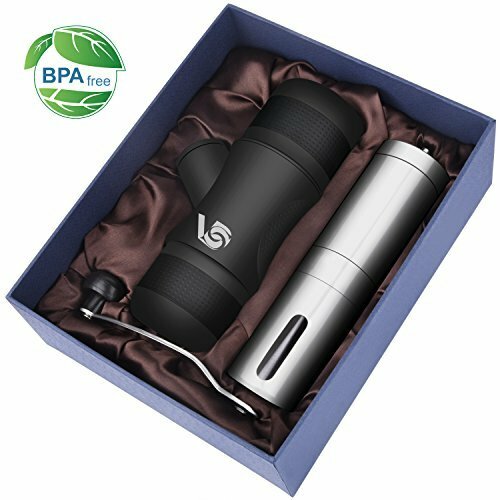 ◕‿◕ Use at Everywhere - Perfectly Ergonomic Hand-held Designed for the Coffee Lover on the go.With 8 bar pressure, it produce coffee and espresso which has rich flavor, lower acidity or bitterness.Great for both home serving and as a traveling mini coffee maker. ◕‿◕ WARRANTY AND PERFECT GIFT-12 Months Warranty, 30 Days Money Back Guaranteed - make sure you spend your money with ZERO risk. If you are looking for the perfect halloween gift for that friend or family member that loves their coffee, then look no further. The Mini Manual Espresso Maker is your one-of-a-kind, unforgettable present. Whether it's for a wedding, house-warming, Birthday, Christmas or Valentine's Day you can give the Sweet Alice Mini Coffee Maker with confidence. If you have any questions about this product by VDS, contact us by completing and submitting the form below. If you are looking for a specif part number, please include it with your message.